On the southern edge of Iceland, minutes away from the black sand beaches of the Dyrhólaós peninsula is a lone cave called Loftsalahellir. If you're traveling along Iceland's Route 1, commonly known as the "Ring Road," prepare your eager eyes for miles of dramatic scenery you never would have thought existed as you travel the southern part of this stunning country. After wrapping up a stop at Skógafoss, pull out your map and chart a side trip to Dyrhólaós, a dark, craggy peninsula intimidatingly sticking out into the icy North Atlantic. But before you arrive at the coast, there's a remote cave that stands tall above the surrounding desolate land worth exploring by foot. Hiking up into this cave on a gray late October afternoon under rainy and windy skies reminded me of something straight from an old Icelandic Saga. There's not much documented history written about mysterious Loftsalahellir, but the little we do know is folkloric and somewhat humbling. Burrowed away in the bulbous Geitafjall Mountain made of tuff rock, is a gaping hole on the southwest side revealing a large cave once used as a special place for council meetings by the people and farmers of the nearby Mýrdalur area. From inside the cool and spacious cave, on a clear day you'll get distant views of the steep cliffs at Dryholaos worthy of a postcard, and there's an additional cave above Loftsalahellir accessible via scrambling or a rope. 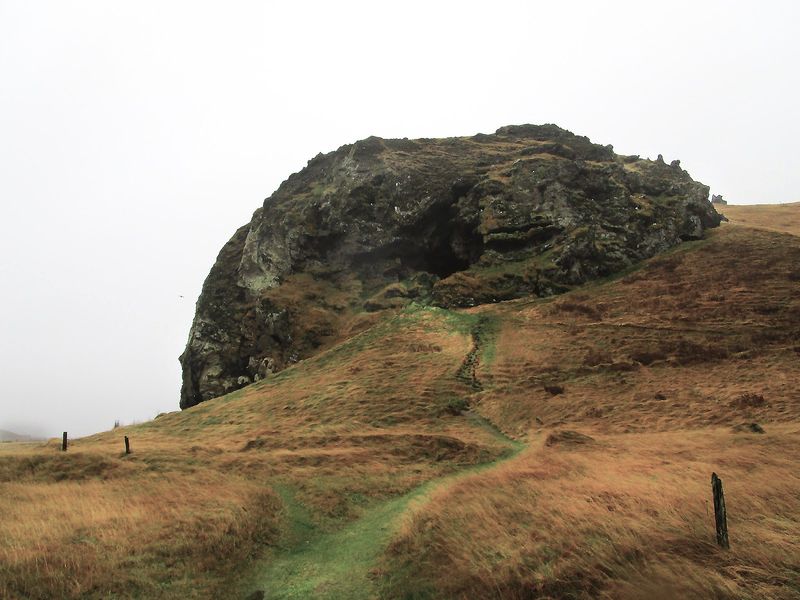 It's thought too that local criminals were once executed just steps west from this cave at Gálgaklettur or "gallows rock." Accessing and exploring Loftsalahellir is fairly easy to do, and you should give yourself about an hour max. From Route 1, the "Ring Road," turn onto paved Route 218 near Þjóðvegur and continue south towards the coast for about five minutes. On the left side of the road, you'll see a blue and yellow sign that says "Loftsalahellir," turn left and continue along a dirt road. Note, in adverse conditions you'll probably want a true 4x4 as there may be deep standing water, mud or snow. On the horizon you'll see a pair of abandoned red barns, continue towards them until you arrive at a small parking area. From there, you'll want to don a pair of sturdy hiking boots as the trail up to Loftsalahellir is fairly steep on grass that will most likely be muddy and slippery. Be ready to possibly fall on the approach. Once you're in the cave, find calm and presences, while staring out onto majestic Iceland below. Between the waterfall Skógafoss, its village of Skógar, and the next biggest town on the radar of Vík, there's plenty of mesmerizing places to get out and explore, several destinations to find even more of that like none-other stillness Iceland gives. There's Fjaðrárgljúfur, a mossy two-million-year-old canyon that shoots 300ft down to the clear, rushing Fjarðará River, the black beaches and basalt paradise of Reynisfjara, and Vatnajökull National Park's perfect hiking trails. Related: 10 Tips for Driving and Renting a Car in Iceland; Where, Why and How to Camp in Iceland.